It is time to introduce a new compact 6-component speaker system Genius SW-5.1 3500 gaming series GX.Impressive aggressive design is impressive, and a respectable 80 watts of power allows to reproduce a rich palette of dynamic surround sound effects in the standard 5.1 from any source. Satellites very simple fixed to the wall, allowing you to implement in the cinema. Dual input allows you to connect 6-channel PC sound card , MP3/CD/DVD- player or TV. remote control allows you to adjust the volume and bass levels, or switch from 2ch 6-channel mode. 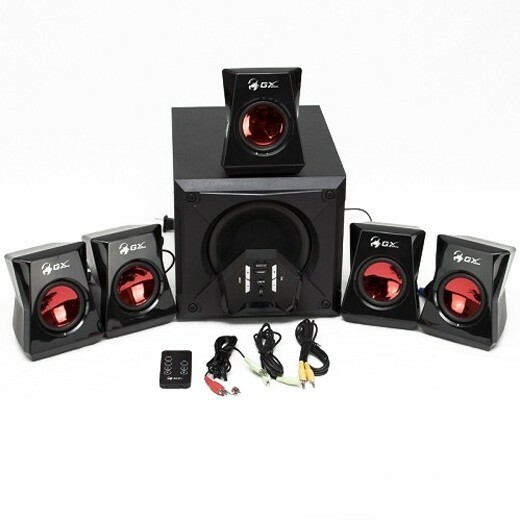 For more visual effect LCD back light sub woofer changes color randomly while playing music or movies. Genius SW-5.1 3500 - great for movie fans and gaming enthusiasts. Plug and immerse yourself in a true surround sound.